...and this nothing like a lace shawl, boom boom. It's amazing how six extra plies of yarn can turn a frustratingly difficult but potentially gorgeous cobweb into a one million times easier but potentially nice throw. I made more progress on this last night than I did in the previous week on the 2 ply blue version. It's nice enough, but it's most definitely a cosy lap blanket style now rather than an heirloom quality delicate lace shawl. 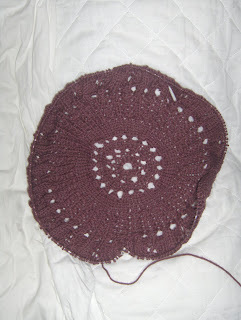 This is ok, because not only am I now motoring ahead on the thick version, I'm also far more determined to make the lace version work, now I know where the bits go. I know this is only DK weight, but compared to the other it feels like Super Bulky. I'm now onto chart C and have finished up my first ball, which is another reason why I'd like to do the laceweight one, with 1800 or something yards per skein! You don't give up easily! Good for you and Girasole! I love the new Girasole too apart from having more end to weave in, isn't it great when it grows much quicker?